Saturday was a sad day for the animals of Tampa, Florida. The staff at the Animal Coalition of Tampa Bay were wakened early last Saturday to learn their low-cost spay/neuter and vaccination clinic had burned. The fire was intentionally set, possibly to cover the theft of petty cash from the register as well as from a donation box on the counter. The worst part? The three cats that lived at the clinic- Jazz, Boy, and Mama, died in the fire. Fortunately a pit bull survived. This clinic spays and neuters animals to avoid euthanasia, and provides the service for ferals as well as family pets. Donations are needed to help the clinic rebuild. You can go to the Animal Coalition of Tampa Bay web site or their Facebook page to find out how you can donate. And if you live in the Tampa area and have any information regarding the crime, please report it to law enforcement. The perpetrators of this crime should not be allowed to get away with what they’ve done. I’m so very sorry to hear of the fire. Just tragic … people will never cease to amaze me. I am too. But people break into clinics all the time for drugs. But they don’t typically set fires to cover their tracks. This is so sad, especially because the lives of three cats were lost – and for what. I hope the rotten scoundrels are found and get what they deserve. I do as well, Barb. I hope the clinic is able to rebuild to be bigger and better, in the memory of the cats that died. I feel so too, Marina. What. The. Hell?! I’m sorry, but what kind of incredibly crooked moral compass must you have to first, steal from a donations box, and then burn down the place. These criminals must have heard the cats and pit bull. Terrible, just terrible. So sorry to hear about this. That’s assuming you HAVE a moral compass. Many people actually don’t. Oh no, I’m so sad that Boy, Jazz and their mom died in the fire. What’s in the head of people who steal the donations and some money and set a whole clinic on fire? I hope the police will find the causer(s). Were they looking for drugs? Money? Who knows. But the blatant disregard for the good work this clinic does is what hurts my heart. Dreadful and devastating to all concerned. So sorry for the loss of the cats. That’s awful. I hope they find the people who did this before they do something similar again. That is just horribly sad. I hope my friend Karma pays those evil humans a visit very quickly, a very painful visit. How extremely sad. It’s bad enough when lives are lost due to faulty wiring or an accident, but for a person to intentionally set a fire to cover his/her crime when they know lives will be lost is disgusting. There aren’t enough words to express an act like this. 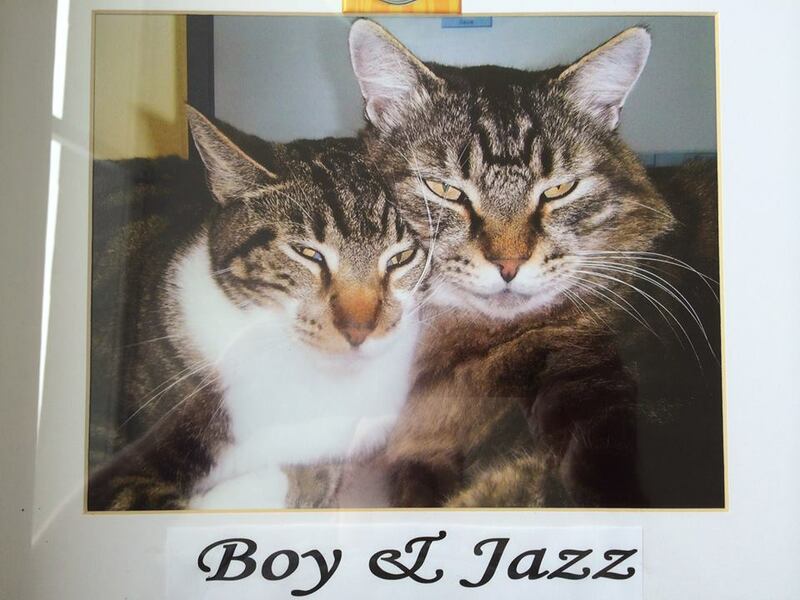 Poor Boy, Jazz and Mama…..I’m so sorry to hear about what happened to them…I hope that this clinic will be rebuilt for animals who need helps again…..
I’m so sorry for the kitties who lost their lives, and the loss of this invaluable resource to the community. That’s terrible. I hope they find who did it. Thanks for informing us about this, Rumpy. Sad. How awful…those poor kitties. I sure hope they catch the one(s) who did this. That is so sad Rumpy. I wish they could do to them what they did to those cats. So heartbreaking. We hope they know who did it and they are punished big time. I hope they get enough money to build an even better place. How can anybody just do that ?! Sad to the bone to read this. Going to go and donate something. Very sad news and totally unnecessary. What’s wrong with people? Oh how sad… who steals from a non profit… seriously! Absolutely an act of evil…I am weeping here. I can only imagine the sheer terror Jazz, Boy & their Momma felt…I think I am going to be sick…. A sad day indeed for our area. Humans are simply the worst being on the planet! Love and Healing to Mama, Boy and Jazz who lost their lives, and to all affected by this appalling example of “humanism” People such as these, find Universal Justice (or it finds them), someday, some way, somehow, and I can’t wait. Tragic and heartless and incomprehensible. What is wrong with people like this? So sad that three beautiful kitties died. If caught, the perpetrators shouldn’t be treated any different than if they had burned three humans to death.